During a press conference held in the opening day of Boot, Ferretti Group announced the exclusive license agreement of the Wally brand, further enriching its range, which thus becomes the widest and most innovative of the Italian nautical industry. The agreement represents a fundamental step in the brand acquisition process and allows the Group to work immediately on the further development of the brand. 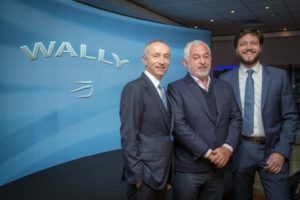 Wally founder Luca Bassani will continue his activity of design and development of the Wally projects, including the sailing yachts, that will maintain the hallmarks and style that set the brand apart. The Ferretti Group together with Bassani’s proactive presence, will give continuity to the Wally DNA. “There has long been a mutual fascination between us and Wally and from today we will continue to develop this extraordinary brand with method, vision and investments. And with the same energy and creativity that have led Ferretti Group to the top of the yachting world,” says Ferretti CEO Alberto Galassi.